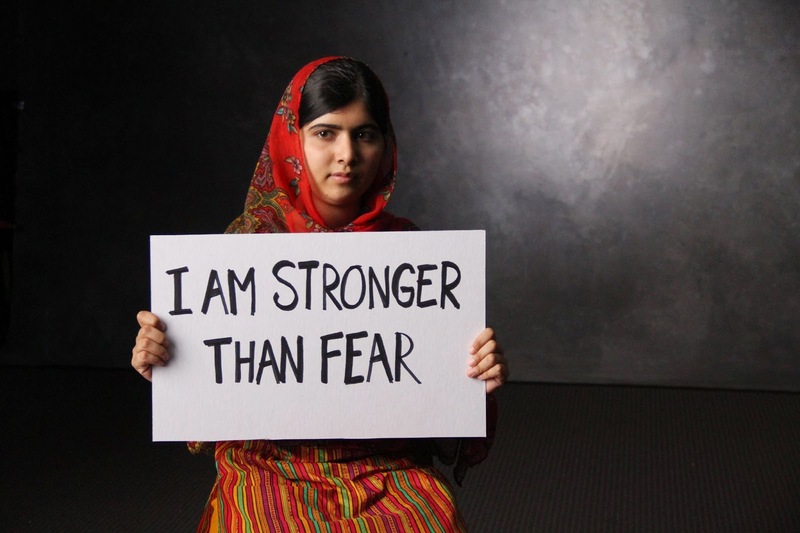 Malala Yousafzai, the world's youngest Nobel Peace Prize Laureate, is possibly one of the most inspiring, strongest women in the world. She faced down the Taliban, weathered a bullet to the head, came back and recovered-- and then told them, "I am stronger than fear." She's not even 20. As a person who recently had a relatively minor brain surgery-- no Taliban bullets here!-- I can nevertheless tell you that surgery on the head is no joke. She was brave before they shot her. She was brave during her recovery. And she's brave now. In her honor, here are a few quick book recommendations about strong girls in adverse situations. Both of them are written in prose poetry, and both celebrate courage, determination, and love. 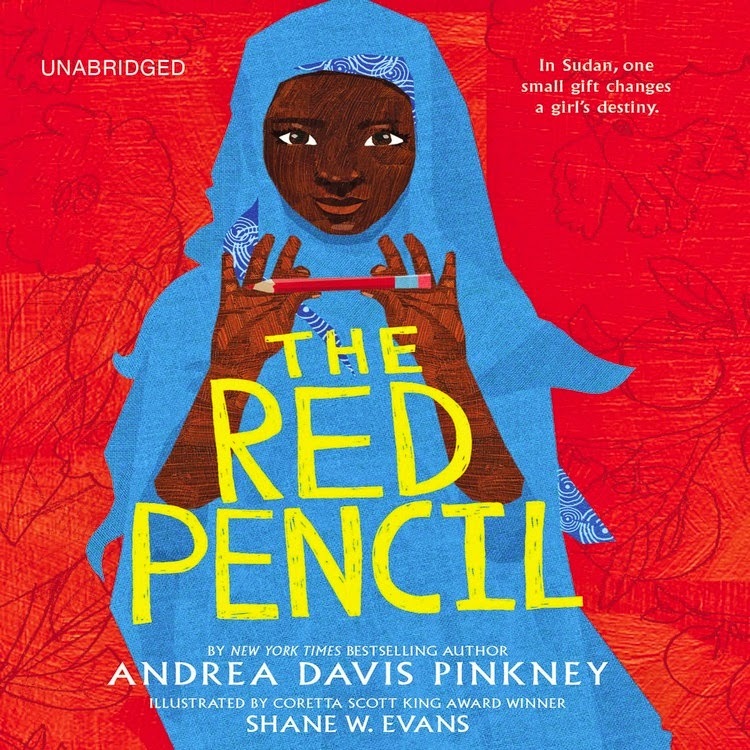 The Red Pencil by Andrea Davis Pinkney. Amira is a Muslim girl who lives happily with her family in the Darfur region of Southern Sudan. 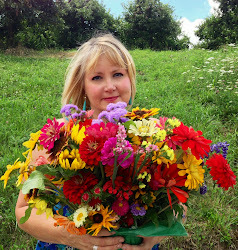 Their family has a deep connection and love for the land they farm and the animals they tend. Amira is very close to Dando-- her father-- and Muma--her mother. When her baby sister Halima is born crippled, Amira takes it upon herself to watch over and guide her. The two sisters are great friends. Then the Janjaweed, government forces in the civil war in Sudan, descend on the village, burning and murdering. Dando is killed in front of Amira's eyes. Muma and her daughters flee on foot to a Displaced Person's camp, where they try to exist in their deep grief and shock. Amira loses the ability to speak, until a visiting teacher gives her a red pencil. Amira draws her father, her goats, her village, and the English letters she learns, one by one. As she gives form to the trauma and loss she has experienced, her voice returns, and Amira decides she must go to school. For her sake-- and for Halima's. This book is exquisitely written in short prose poems. It is illustrated throughout in Amira's drawings, done by illustrator Shane Evans. This is a quick, affecting read that will leave you with wonderful visions of African moons, multicolor toobs (pronounce TOE-B), the Muslim attire the women wear, and possibilities within hardship. It is studded with beautiful Arabic terms and includes a glossary and pronunciation guide. The other book I recommend is Serafina's Promise by Ann Burg. Serafina works alongside her mother on their family farm in Haiti. She travels far for heavy buckets of water to feed their struggling hillside crops, and helps to care for the family. Serafina's mother lost a child-- Serafina's baby brother-- who died of starvation soon after his birth. 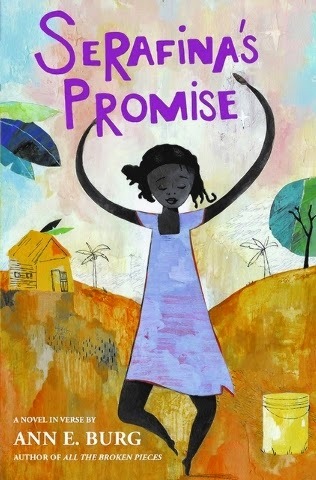 Serafina vows to work hard enough to help the new baby her mother is expecting survive, but her secret hope is to become a doctor. She wants to be able to heal children who suffer and who are sick, so that no child has to experience what her baby brother Pierre endured. There was a beautiful Haitian woman doctor who tried to save Pierre, who deeply impressed Serafina. More than anything, she wants to go to school. But school is not free in Haiti, and tuition and school uniforms are beyond her family's reach. When the earthquake destroys their farm, Serafina struggles to find the doctor she admires so much to save her mother and the new baby. This book, again, written in short prose poems, spangled with Haitian Creole, shimmers with beauty. The characters' love and devotion to each other, Serafina's courage and determination, and ultimate triumph are super rewarding to read.